Come join our new eCookbook celebration at RecipeLion.com with daily giveaways, recipes, and a grand prize giveaway worth more than $2,000.00! 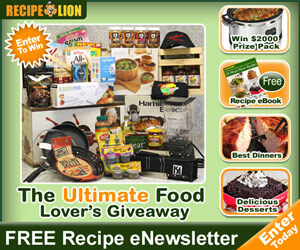 The Ultimate Food Lover’s Grand Prize Giveaway! Enter to win The Ultimate Food Lover’s Grand Prize Giveaway! Filled with more than $2,000.00 worth of amazing prizes from 16 companies, this prize pack is an epic assortment of kitchen appliances, delicious goodies and more! The deadline to enter is August 13, 2014 at 11:59:59 p.m. Eastern time.